The past couple of weeks I’ve been reading Dogsbody to the kids at bedtime. I love it! I’m now a huge Diana Wynne Jones fan despite having never heard of her before. The book is so well-written and so entertaining in a can’t-put-it-down kind of way. It’s a fantasy novel told from the perspective of a dog and it’s clear the author knows about dogs. It’s set in England in 1975 at a time of tension between England and Ireland. People today associate terrorists with Muslims but back then it was the IRA blowing things up. I’m fairly ignorant of the politics but I should point out that the IRA did not blow themselves up and nor did they make it their modus operandi to target civilians as Islamic terrorists do. However it seems poignant that terrorism is still a problem today; only our foes have changed. Terrorism doesn’t feature in the story but a young Irish girl, the main character, is the victim of racist abuse because of the political situation at the time. I was surprised by this because I didn’t realise the Irish were targeted by racists. I read that if you like the Harry Potter books then you’ll like Diana Wynne Jones. I definitely plan to read some of her others stories. Last weekend I ordered a cubic metre of wood chips to put under the new trampoline. This was a stupid idea for two reasons: a) Ben was away in Russia when they arrived. b) We have no pavement outside our house because the city council is still ripping up tree roots and putting in a new one. This meant I had a couple of problems. Where was the delivery man going to put a cubic metre of wood chips? And how was I going to transport them to our backyard very quickly and by myself? 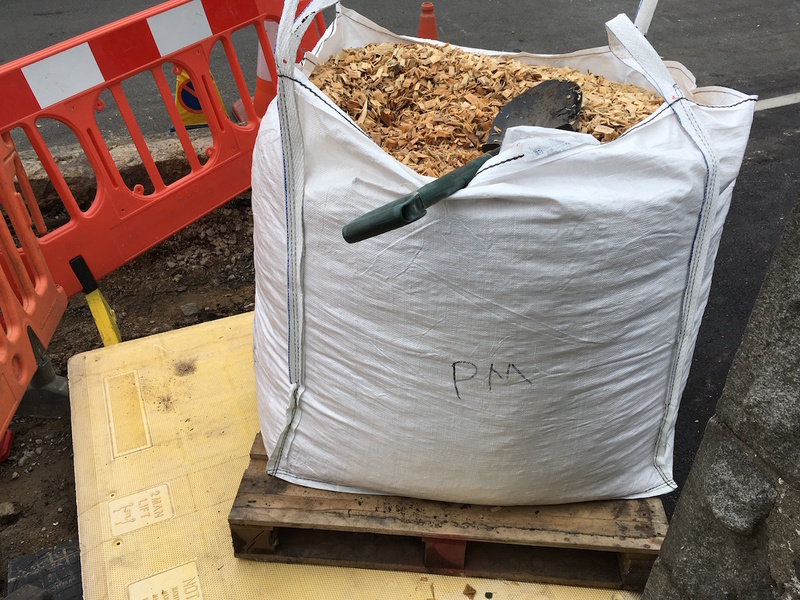 The wood chips arrived on Tuesday afternoon, after the city council workers had left for the day. I was pleased about this because the irony of my fierce objection to them felling our trees and then ordering a cubic metre of chopped up tree was not lost on me. I didn’t want them to see the wood chips because that would have been embarrassing! This meant I had to get rid of them that evening before they turned up again the next morning. As you can see there’s no pavement there at all. The bag had to go on that yellow board. As soon as it arrived I got to straight to work ferrying wood chips to our back yard. This was not an easy task because I had to take them up some stairs, through part of our house, then down some stairs. From there I could use a wheelbarrow and transport them all the way down to the very back of our yard. I tried to rope the kids into helping out but after a few small bucket-loads they lost interest. How did the Victorians ever get kids to work down the mines? Kids today have it too easy. Posted in Journal and tagged book review, books, Diane Wynne Jones, Dogsbody, novel, wood chips. Bookmark the permalink. I’ve not heard of the book, but it does sound like fun. I lived in England when the IRA was bombing places; it’s when that whole ‘don’t leave a package unattended’ started. I think you’d like this book. Anyone who loves dogs would enjoy it. It almost makes me want to get a dog again. You did well with your wood chips. Sounds like a way to keep fit. I’m not entirely sure I understand the distinction you are making between terrorist groups though. I was more trying to point out how when a group does something we don’t like – set off explosives – we have a tendency to dislike everyone who belongs to that group even when most of the individuals in it have nothing to do with what happened. I was really trying to point out why racism is misguided. And yes. There were a spate of anti abortion attacks and animal rights bombings so for a time those holding similar views were held to justify the extreme behaviour. I congratulate you on getting the wood chips moved by yourself. Looking at the mess the council made of your pavement, I shook my head. I imagine taking a walk there is a challenge. I will make Howl’s Moving Castle the next one we read! Then we can watch the movie afterwards. I always like to read the book before watching the movie. 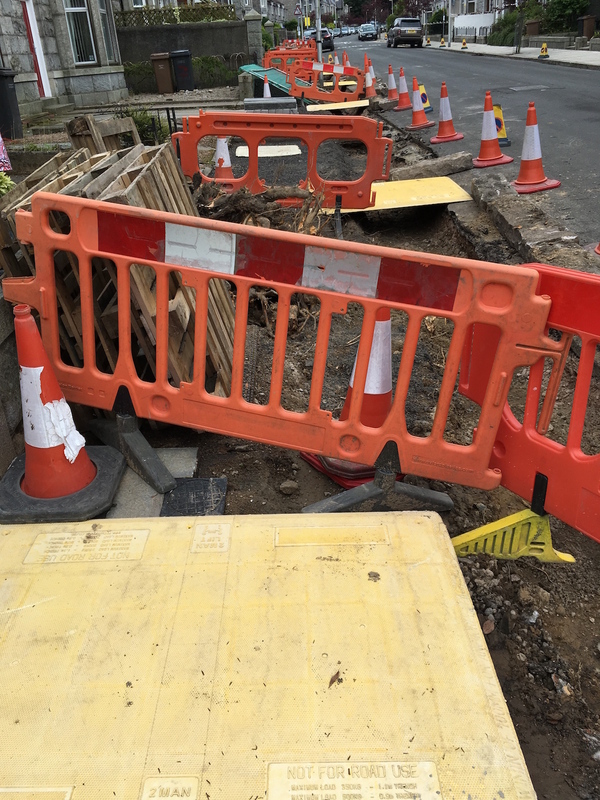 They did make a huge mess of the pavement and for no good reason and at great expense. They seem to be making some progress though and it no longer looks like the photo although we still can’t walk on it. Very determined of you with the woodchips. I think I would have despaired. There are so many of them in that bag. I didn’t have any choice but to move them all. Once I got going it wasn’t so bad.